Named one of China's UNESCO World Cultural Heritage Sites in 1987, the Forbidden City is probably ​China's most well-known museum. Its famous red walls housed Ming and Qing emperors for nearly 500 years. Now the halls, gardens, pavilions and nearly one million treasures are visited and viewed by millions of tourists each year. Don't be misguided by the word "museum" in the official name. You will not be visiting anything like a standard museum where treasures are housed within glass boxes and visitors file along from room to room. A Visit to the Palace Museum is more like a very long walk from one enormous plaza to another enormous plaza broken up by peeks into different official and residential buildings where the court and their minions ruled and lived. 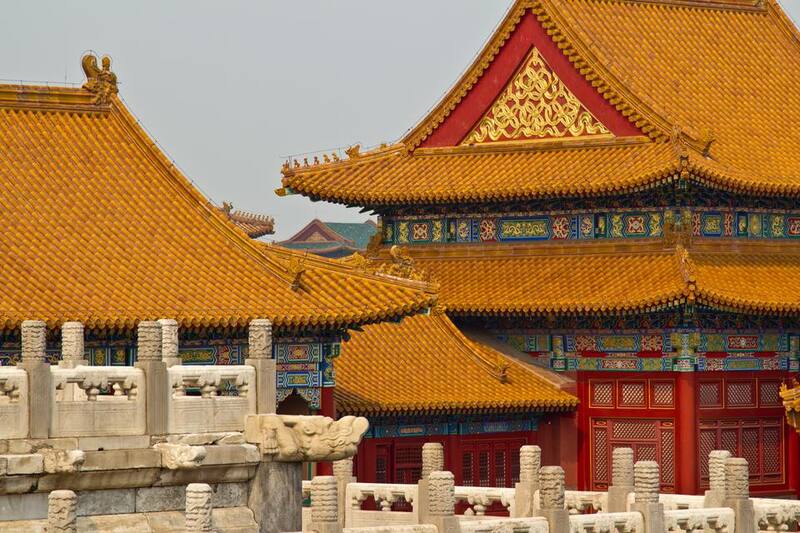 The Forbidden City is located in the heart of Beijing, directly north of ​Tiananmen Square. The third Ming emperor, Yongle, constructed the Forbidden City from 1406 to 1420, as he moved his capital from Nanjing to Beijing. Twenty-four successive Ming and Qing emperors ruled from the palace until 1911 when the Qing dynasty fell. Puyi, the last emperor, was allowed to live inside the inner court until his expulsion in 1924. A committee then took charge of the palace, and, after organizing over a million treasures, the committee opened the Palace Museum to the public on October 10, 1925. Each side has one gate. Tourists today enter through the southern Meridian Gate (Wu men) and exit through the northern Gate of Spiritual Valor (Shenwu men). Audio guides in multiple languages are available at the Meridian Gate (Wu men) and the Gate of Divine Prowess (Shenwu men). Rental requires a deposit which you get back when you turn in our audio guide at the exit. Bag check at Meridian Gate, Wumen (but you'll have to go all the way back to get it at the end of your trip). Recommended time for visit: at least three hours. Visitors enter the Forbidden City from Tian'anmen Square through the big red wall with Mao's portrait hung on it. This is the southern end of the palace and you'll walk the length of the compound to the northern end. It's not a round-trip visit but rather a long exploration through the compound. Consider that when meeting people or checking bags. If you need to get back to Tian'anmen Square after your visit, it will be another long walk (or short cab ride) back. Wear comfortable shoes and think about sun protection. The walk itself, with nominal stops to look at buildings, will probably take you 2-3 hours. There is little opportunity to sit down and rest and very little shade. Consider going on a guided tour. You'll get a lot more out of your experience if you know what all the buildings were for and what happened in them. Otherwise, it's just a series of similar buildings separated by long walks through big plazas. If you haven't come with a guided tour, consider an audio tour. Even though you'll feel like you're passing all opportunities to rent one of these, hold out for the Roger Moore narrated audio guide. It's worth it. As you enter through the Meridian Gate, be on the lookout for shops selling a lovely map of the Imperial Palace. If you would like a nice souvenir, grab this now. Unlike 99% of other souvenirs in China, where you see the same things time after time, you will only ever see this map in the shop that is located at the beginning of the tour of the Forbidden City.